England 3-41 (Alastair Cook 22*, Nick Compton 9, Ravichandran Ashwin 2-21) trail India 8-521 declared (Cheteshwara Pujara 206*, Virender Sehwag 117, Yuvraj Singh 74, Graeme Swann 5-144) by 480 runs. Cheteshwar Pujara hammered his maiden double ton as the Indian spinners stunned England in the dying moments of the second day’s play by grabbing three wickets. India declared their first innings after piling up 521 runs for the loss of 8 wickets in 160 overs and England was struggling at 3-41 in 18 overs. The second day’s play concluded on Friday, November 16, 2012, at Sardar Patel Stadium, Motera, Ahmedabad. Earlier, India started the day at 4-323 after playing 90 overs, Cheteshwar Pujara was two runs short of his hundred and Yuvraj Singh was controlling his end for 24. 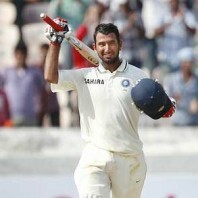 Pujara celebrated his second Test century on the first ball of the 95th over with a four as Yuvraj added 10 runs on the last four balls with 1 six and 1 four. The duo survived a few huge leg before wicket shouts in the process as Yuvraj attained his 11th Test fifty on the third ball of the 107th over with a four. The home side reached 410 at lunch interval in 121 overs and added another three runs after the break when Yuvraj Singh was gone for 74 off 151 balls with 2 sixes and 6 fours. 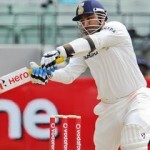 MS Dhoni became the fifth victim of Graeme Swann for just five runs as Ravichandran Ashwin joined in next with Pujara. The batsmen were unable to speed up the run rate and most importantly kept the wickets intact but geared up after the 142nd over. Ashwin was dropped on the fourth ball of the 152nd over by Alastair Cook at extra cover off Samit Patel at 20 runs and the fifth hundred of the innings was also posted on board. 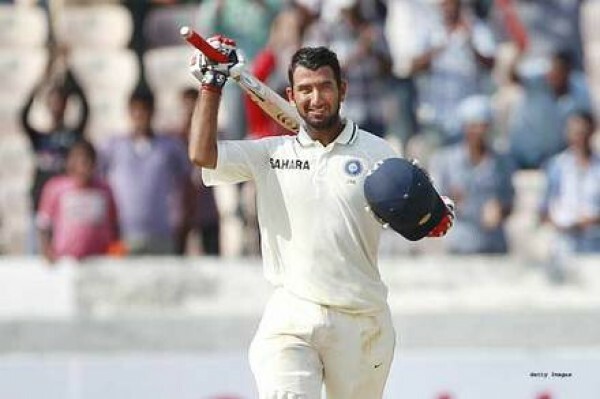 Cheteshwar Pujara kept his nerves and dispatched his first Test double century on the third ball of the 154th over with a single while representing India in the sixth Test. 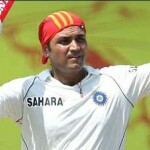 It was the first double ton by an Indian batsman vs. England after about a decade. The great batsman of India, Rahul Dravid, thrashed 217 runs against England previously on September 5, 2002, in the fourth Test played at Kennington Oval, London. Dhoni declared the innings at 521 with two wickets remaining in 160 overs, Pujara stood firm at 206 scored on 389 deliveries with 21 fours. Graeme Swann was the star performer for England as he clinched five wickets which was his 14th five wickets haul. James Anderson, Samit Patel and Kevin Pietersen shared one wicket each. England went into bat with their skipper Alastair Cook and the debutant Nick Compton whereas Dhoni surprised them by handing over the ball to the off spinner, Ravichandran Ashwin. Cook hit a couple of fours in the very first over followed by another one in the second over which was bowled by Zaheer Khan. The Indian captain introduced the left arm spinner, Pragyan Ojha, in the 9th over and Ashwin made the first breakthrough when Compton was clean bowled for 9 runs on the third ball of the 14th over. The night watchman of the tourists, James Anderson, was caught smartly by Gautam Gambhir at short leg in the next over off Ojha for two runs and the second wicket fell at 29. Ashwin Struck again in the 16th over when another competent batsman, Jonathan Trott, was caught at short leg by Pujara without opening his account. Kevin Pietersen got together with Cook in a critical stage of the match and both survived until stumps on the day two. England reached 41 in 18 overs as Alastair Cook and Kevin Pietersen were unbeaten on 22 and 6 runs respectively. The Indian spinners have penetrated through the top order batting of England and an early couple of wickets on the third day of the match will put the home side on top. The visitors will depend a lot on the two composed batsmen on the crease at the moment and their batsmen have to play confidently against the lethal spin attack of the hosts. Looks like England are going to have follow-on if no hero comes to rescue. KP looks dangerous as usual and if Indian spin duo can get him then England will find hard to recover.